The injured firefighters, Ethan Sorrell and Kevin O'Toole, continue to show signs of progress each and every day. The volunteers firefighters are still in the Burn Unit ICU at Medstar at the Washington Hospital Center. Ethan had his breathing tube removed and is now breathing on his own. His spirits have increased as he was encouraged to walk the hallways and had the opportunity to spend time with some visitors. Kevin had skin graph surgery performed on several of his burns today and we were told that it went well. Both Ethan and Kevin are currently resting at the Doctors direction. 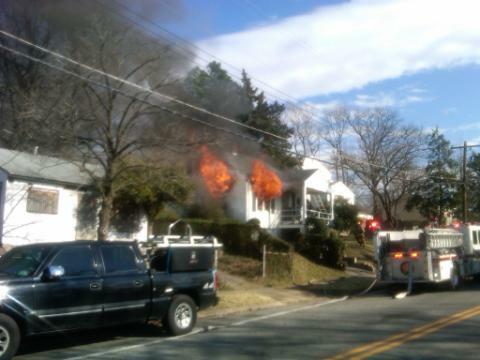 Fire and smoke coming from the house in the 600 block of Goldleaf Avenue after arrival of the Fire Department. Photo credit to Assistant Chief Steve Hess PGFD. Firefighters and paramedics from the Seat Pleasant community were alerted to a house fire at around 2:50 this afternoon. Firefighters arrived at the 2-story single family home in the 600 block of Goldleaf Avenue with heavy smoke issuing from the structure. Firefighters initiated an interior attack and search/rescue. All searches proved negative and the fire was knocked down in about 15 minutes. A female occupant was at home and was able to escape the home safely. No injuries, civilian and firefighter, were reported. Two adults occupants of the house will be displaced and they are making their own living arrangments. Cause of the fire is unknown at this time and fire loss estimates are not yet available. The Prince George's County Fire/EMS Department will hold a press conference to announce results of recent community canvassing with fire safety information and smoke alarms. The Fire/EMS Department has been very aggressive, more than usual, in our efforts to ensure every home has a working smoke alarm. Because of this aggressiveness we have depleted our supply of new smoke alarms. Officials from PEPCO will be on hand to deliver a extremely generous donation of smoke alarms to Prince George's County. They are making a huge donation of alarms. Another group supplied the Fire/EMS Department with a quantity of smoke alarms that helped us bridge the gap between PEPCO Donations. The local franchise of 1-800-Board-Up will be on hand as well. We will also remind everyone that the first of every month is the day we have designated for you to test your smoke alarm and ensure it is working. Safety First Day of the Month!!! WHO: Fire Chief Marc S. Bashoor, Officials from PEPCO and 1-800-BOARD-UP. Families that have been saved from a working smoke alarm have been invited to this event to provide their personal story.